The season of mists is upon us, the fireplace silent with the first ashes lain motionless, morning frost chilling the small of my back as I roll out of bed begrudgingly. The protracted dawn, diminishing in light, reminds me of the dwindling of daytime and brings the knowledge of death closer. The knowledge that, like with all natural things, this is the fate that awaits every one of us too, some day. It is then, at those early morning hours, Halloween looming or not, curling my hands around the steamy cup of malotira tea, looking through the misty windows at the black-billed magpies, gliding from perch to perch with renewed vigour, that I think of my dearly departed. There is deep feeling, akin to drama, in all aspects of commemorating the dead in my culture. And this is where the "kollyva/koliva" (κόλλυβα) pudding comes in, making me a little choephoros (libation bearer), as I amass pots & pans and test the heaviness of the pomegranates to determine whether their seeds will be juicy enough. 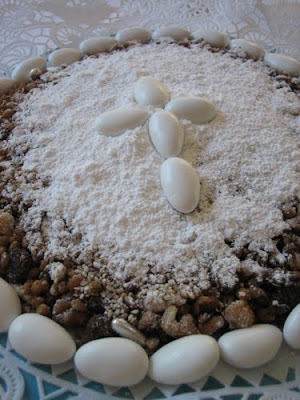 A special memorial dish of the Eastern Orthodox and Greek Catholic church, made of shredded wheat, nuts, raisins, pomegranate seeds and sugar, koliva/kolyva/kollyva is widespread across the Balkans (Serbs call theirs Koljibo for instance) and has an ancient lineage: The word derives indeed from the ancient Greek κόλλυβο, which meant "grain of cereal". The dish is prepared at home but served (and shared) in church for the benefit of departed souls. Participating into preparing and sharing a meal for the dead ~even another person's dead~ is a mystagogy. It's the belief of our ancestors needing life to continue, to be sustained in memory, to still need nourishment; if not in the literal sense, in the spiritual one. By remembering them, we hold them in Elysium. In a way, it's close to how the Mexicans observe their own Day of the Dead; celebrating life in all its earthen dimensions means honouring the dead; they were a part of life's cycle and can still be, beckoning as we do to visit us in their soul form again and humouring them by relaying funny stories of their passage on earth. Everything in the preparation of the delicious dish of "koliva" is symbolic, with tentacles griping both the Pagan and the Christian world, as befits every traditional Greek ritual. The boiled wheat is a throwback to rural products offerings to the many gods of antiquity responsible for the good crops. It's also a symbol of resurrection; as the grain of wheat is planted in the soil to take root and bring forth fruit, so is man buried with the promise of resurrection. 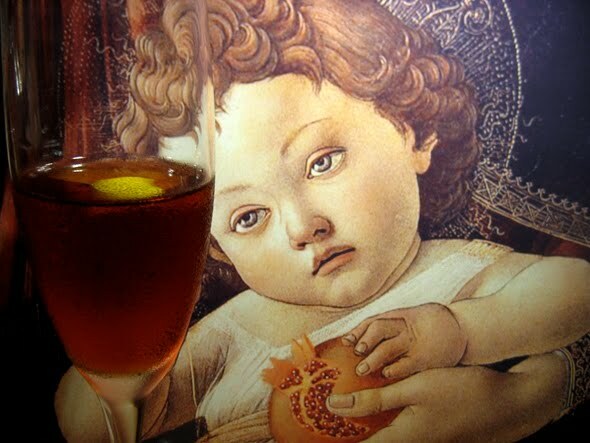 Nuts and raisins are the most concentrated forms of sustenance, essential for the soul's passage through Hades. Anise seeds help to establish psychic sight and ward off the evil eye. Pomegranate seeds recall Persephone and her tale of diving into the Underworld; pomegranate the common thread between the two realms. Dusting sugar is mounted on top to represent the grave, parsley chopped across the borders to recall "the place of growth, of coolness, of repose" that Heaven stands for, rose water to evoke serenity. The dessert is decorated with a cross and the deceased initials in sugared almonds and sometimes "silver candy" and a small candle is lit while the blessing is read; the pudding is then passed onto bystanders in waxed paper bags with a little spoon to eat on the spot or keep for later. But take koliva home and you have to eat it till night falls, or the magic is lost! But with a sweet taste like that, who's to refuse? The oily and crunchy center of the nuts, the starchy chewy grains, the cool and juicy pomegranate seeds make for a delightful contrast of flavours you will want to repeat again and again, preferably unrelated to anyone's passing on. In a large bowl mix the wheat with the assorted nuts, the raisins, the pomegranate seeds, the cinnamon and the anise powdered and add the rosewater for flavour. Transfer the mixture into a wide bowl or deep pan. Now place a piece of waxed paper on top of the mixture and flatten the top, so that sugar is evenly distributed. Sprinkle powdered sugar evenly over the wheat mixture. If you want to decorate with specific lettering or a cross or something, you can make your own cardboard stencil and shift the powdered sugar atop the wheat layer accordingly, leaving an imprint, so to speak. Also use the sugared almonds to make designs or just use them to line the bowl/pan. Finally, add the chopped parsley on the edges. A candle is placed in the middle and lit during the memorial service*. When ready to serve, take large spoonfuls, minding that you put both sugar and the wheat & nuts mixture in each person's portion. Share! Θεός σχωρέσ'τους και ζωή σε λόγου σας! May God rest their soul and give life on to you! *If you want to do this properly as a commemoration** of your dearly departed, plan to be at church before Liturgy begins so that you can give the bowl and your list of names of your deceased family and friends to the priest for the blessing. **According to Orthodox Christian Church tradition, koliva is offered in the Church at the mnemosynon rite (i.e. commemoration) 3 days after death, 9 days after death, 40 days, 6 months, one year after death, and whenever desired thereafter. ***another recipe and home-taken photos by a half-Greek on Feeding the Saints blog. Photo of koliva dish via suvin saran, inspired by Maria Speck's book Ancient Grains for Modern Meals. 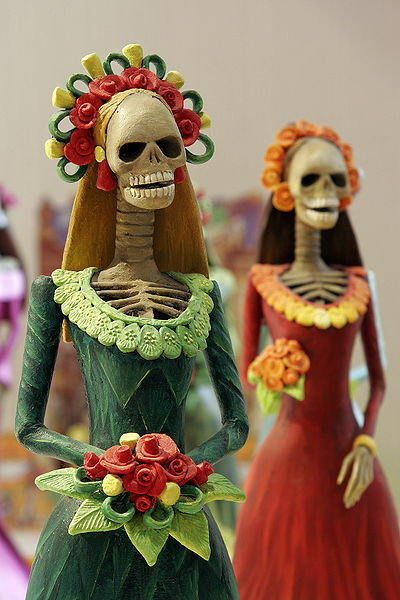 Mexican Catrinas via wikimedia commons. this is a beautiful post, managing to be both evocative and educational, no mean feat! We celebrate Dia de los Muertos in a quiet way here (IL) but our departed are honored,even if only in passing and the lighting of a candle. I am going to try to make it! Looks good and sounds yummy. Thanks for educating and inspiring me. Do you know where I can get rose water? It's important to think of the dead, so you're on the right track. May your day and night be filled with sweet remembrances. thanks for saying so and hope it turns out perfect. Let me know how it went! Rose water can be bought whenever you have an ethnic market/store with Middle Eastern produce. Or try the online shop I have linked for the silver candy in the article (don't recall if they stock it, but should be easy to search for it). Τα κόλλυβα είναι για τα μνημόσυνα, οπότε πάμε τόσο συχνά στην Ελλάδα, που δεν τα θεωρούμε εξαιρετικό γεγονός. Επίσης, έχουμε τακτικά και τα ψυχοσάββατα. Τότε, οι γυναίκες ετοιμάζουν πίτες και μοιράζουν στη γειτονιά. Lovely post Elena. It is delicious Marianne. I prefer parsley mixed added in the mix. In Greece we often make it without the parsley but the first time I tried it with I realized it adds a whole new dimension. Βασικά είναι μια υπέροχη συνταγή την οποία ψάχνω ευκαιρία να κάνω, κι ας μην υπάρχει τυπικό μνημόσυνο (μπορεί να πάει κανείς το δισκάκι στην εκκλησία απλώς για μια επιμνημόσυνη δέηση). Αλλά βρε παιδιά (και συγχωρέστε μου την προσφώνηση οι δυό σας, εννοώ κι ο Χρήστος πιο κάτω), θα σας μαλώσω! Λειψά σας τα φτιάχνουν και τα τρώτε? Εγώ βάζω πάντα ρόδι και μαΐντανό, προσθέτουν πολύ, το δροσίζουν το κόλλυβο. Το ρόδι γιατί να το φτύσετε? Άμα έχει καθαριστεί καλά, να έχουν φύγει οι φλουδίτσες οι πικρές που είναι γύρω γύρω από τα σποράκια είναι νοστιμότατο. Το βάζω και σε σαλάτες στην εποχή του, πχ. με ψιλοκομμένο λάχανο, μήλο και βαλσαμικό ξύδι είναι μούρλια! Τέλος πάντων, γούστα είναι αυτά βέβαια, και δεν είναι υποχρεωμένος κανείς να αγαπά το ρόδι. Απλά μια σκέψη παραθέτω. Κι ευχαριστώ για τα σχόλια! Ευπρόσδεκτα πάντα. thanks for commenting to say so, you know well about it too after all. Indeed, parsley adds coolness to the flavour. I almost never remember to mix it into the whole mixture, though! thank you for this post...we all benefit from embracing our ancestral traditions and learning about others' as well. 'remembering the dead' rituals occur all around the world in strikingly similar forms, reminding us that we are all kindred, and that the human spirit is meant to rejoice and sorrow in company. although not of greek heritage myself, i've made kolyva to offer at funerals/remembrance days---it seems a perfect dish for this somehow. Indeed, you're so right; there are universal themes at play on these subjects (something which fascinates me) and it's interesting to see how it's the nuances that are varied. Αν πετύχω στάρι αυτές τις μέρες, θα το δοκιμάσω όπως λες, γιατί και μαϊντανό έχουμε στον κήπο. Καλά τα κόλλυβα, αλλά λόγω της παραπομπής στους νεκρούς, προτιμώ τον ασουρέ. Που είναι και πιο θρεπτικός, γιατί έχει το ζωμό του σταριού. κι εμένα μ'αρέσει ο ασουρές! Έφτιαχνε η θεία μου όταν ήμουν μικρή και καλό είναι να φτιάχνουμε κι εμείς για να μαθαίνουν οι μικρότεροι. Κι εμένα έτσι μ' αρεσουν τα κόλυβα αν και δεν τα φτιάχνουν συχνά έτσι. Το ρόδι σαν φρούτο μόνο του δεν μ' αρέσει καθόλου: έχει ωραία υφή αλλά το βρίσκω άγευστο. Γι αυτό μ' αρέσει στα κόλυβα και σε σαλάτες, γενικά σε μείγματα. Δίνει δροσιά και δε με πειράζει που δε λέει και πολλά από γεύση. Υποθέτω δεν πολυβάζουν ρόδι γιατί δεν είναι πάντα στην εποχή του, ώστε να το βρούν εύκολα.